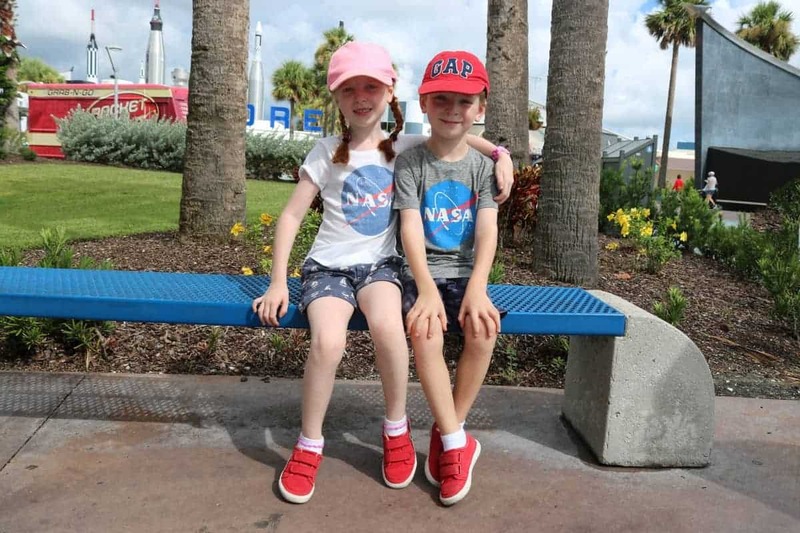 When we were planning our trip to Florida Dave was keen to go back to the Kennedy Space Center, somewhere he had such amazing memories of from his own visit as a child. I wasn’t sure whether it would be family friendly – and whether the children would really understand much of it. 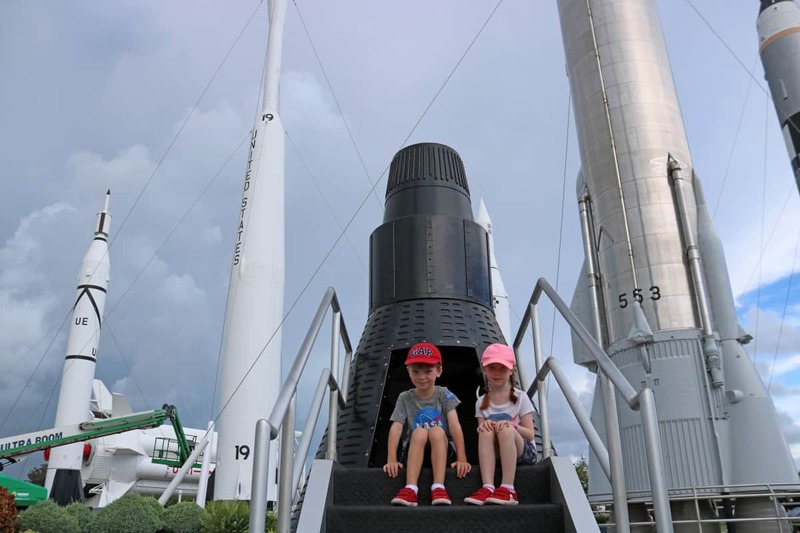 But, with the assurance of an Under 10’s Itinerary on the Kennedy Space Center website we planned our trip – and it ended up being one of our favourite days out in our two weeks in Florida. 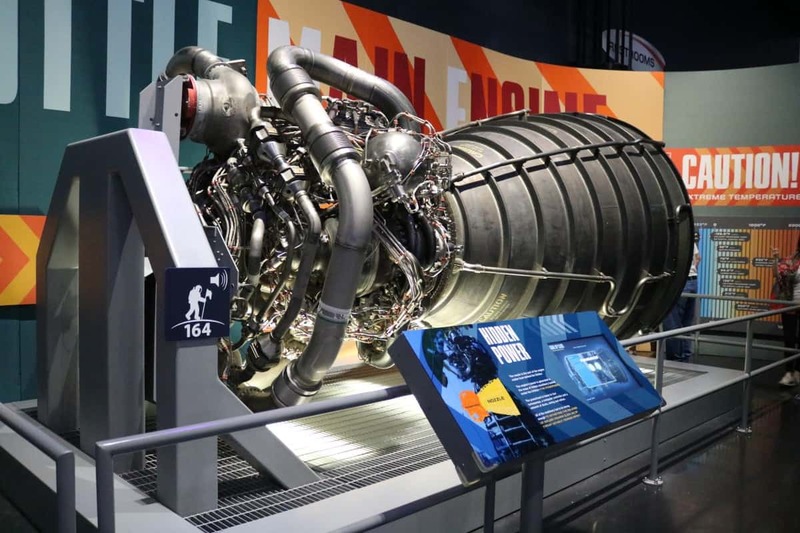 Kennedy Space Center (KSC) is the historical home of NASA and the American manned space program and since 1968, Kennedy has been NASAs primary launch site for human spaceflight. 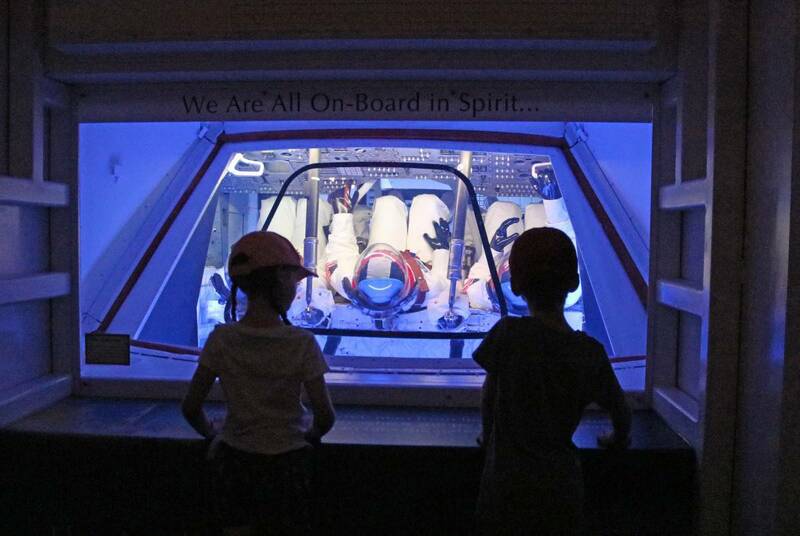 KSC is home to several exhibits dedicated to the exploration of Space – past, present and future. 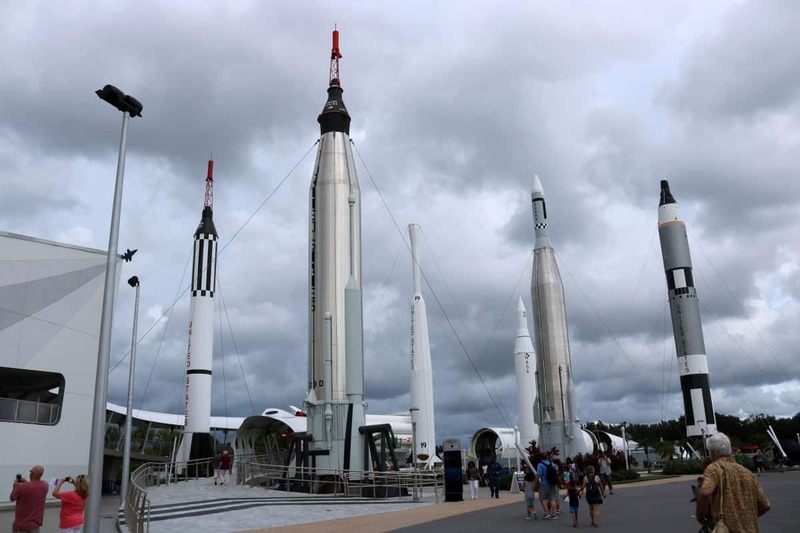 As soon as you get close to the main visitor centre from the main road, you can see some of the taller rockets that are part of the Rocket Garden, scale mock-ups of actual rockets that formed part of the space program. After we’d parked up, the queue at the ticket booths appeared to be moving at a steady pace and there were also ticket machines to make the process even quicker. Whilst we waited for the rest of our party to arrive, we took the opportunity to have photographs taken by the NASA globe logo and to watch the Memorial Wall water jets. When Dave’s parents arrived and we’d got our tickets, we went to the security station where our bag was searched, which seems to be standard practice at public attractions in the USA. This gave us all a feeling of being quite safe and something that never bothered us. The first thing I noticed was the sheer size of the Rocket Garden exhibits up close. 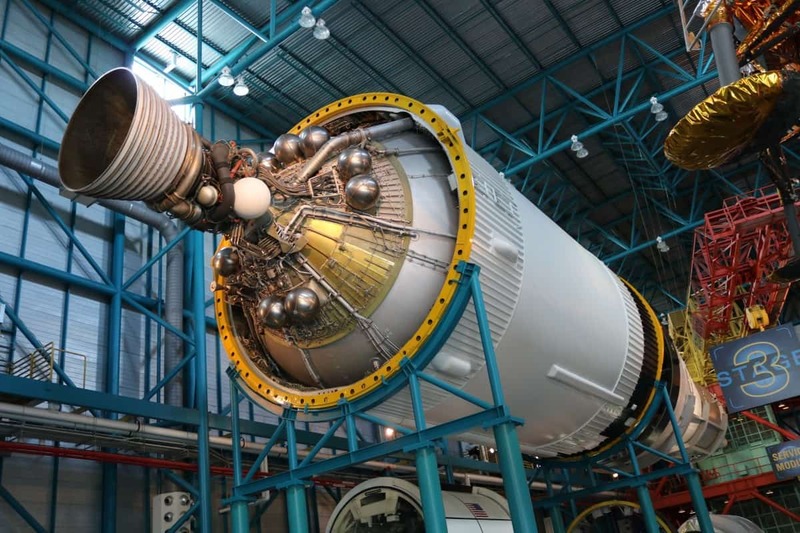 It’s hard to appreciate it when you see similar things on TV or in movies, but the rockets used in the space program are huge. 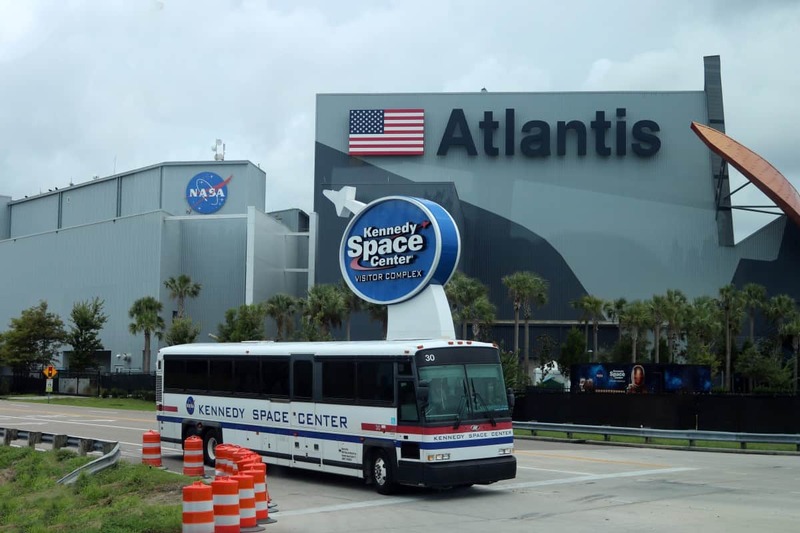 We had already researched our trip to KSC and found a whole range of itineraries on the website. They vary from just a few hours to a whole day of exploring the site, depending on what you want to see. As our children are young, we chose to follow the Under Tens itinerary. 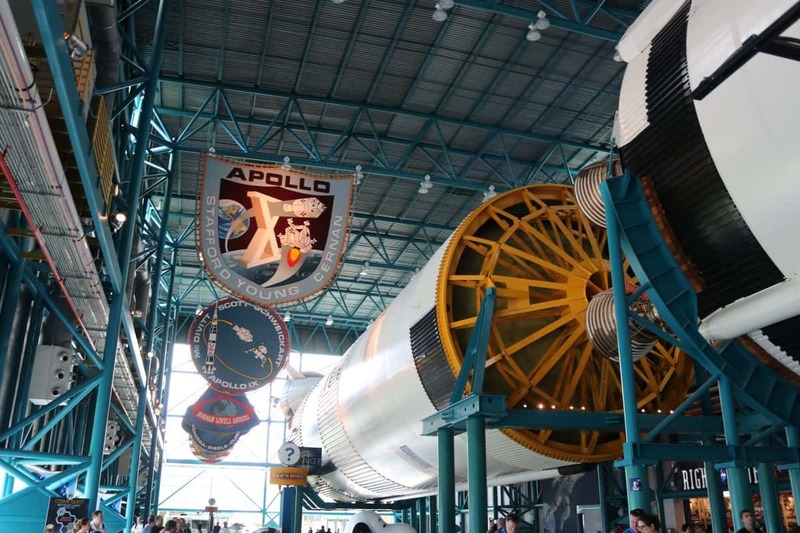 Our first stop was the Hall of Heroes which is in a large building near the Rocket Garden. The Hall of Heroes started with two short introductory movies on huge screens, one of them being in 3D. The first one was about everyday people and celebrities talking about who their heroes are. There were even Astronauts talking about who inspired them into becoming who they are today. After moving through the theatres, there were artefacts donated by US Astronauts and items from the Space Program. 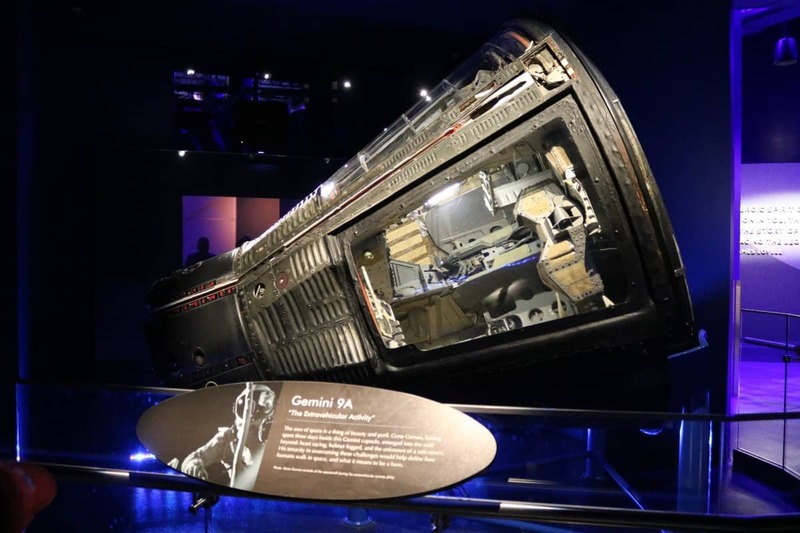 Things like Buzz Aldrin’s actual school report cards, handwritten notes on mission books, uniforms and toys from childhood were all on display with personal explanations behind them. The whole exhibit gave a real sense of who the pioneers of the US Space Program were. 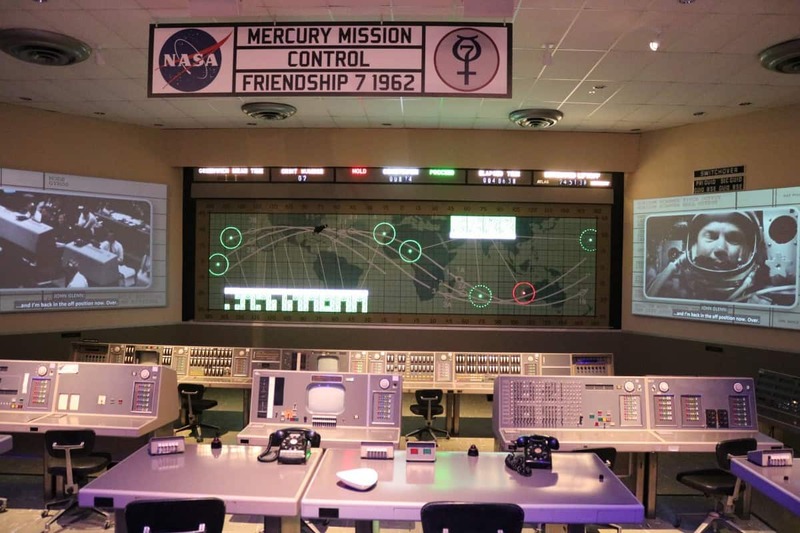 The actual control consoles used for the first manned missions were also on display, in the same state as they were back in the 1960s. 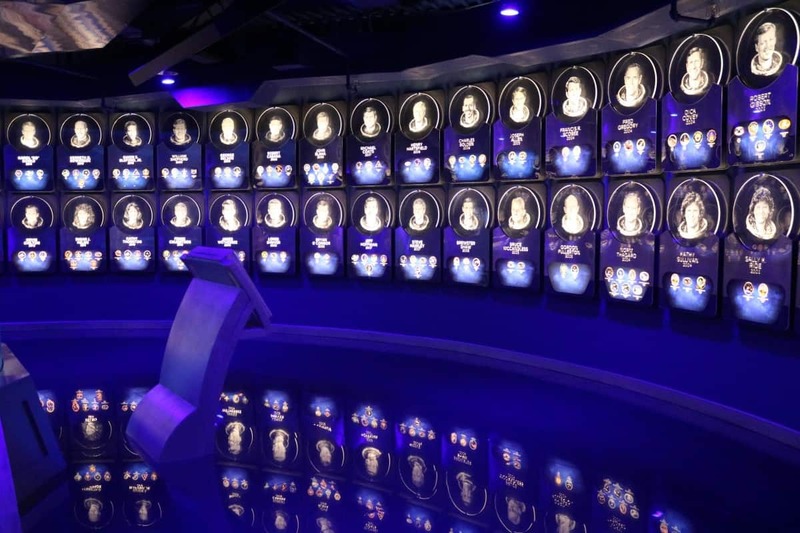 At the end of this exhibit was the Astronaut Hall of Fame which included a statue as you go in as a memorial to Alan Shephard, the first American in Space but who also tragically died with two others on board Apollo One before it had launched when a fire broke out in the capsule. This exhibit is also interactive and you can ask a huge computer screen in the middle to bring up a particular Astronaut that you want to know more about. Our itinerary then took us through the Rocket Garden and towards the Bus Tour which is included in the entry fee. We boarded the bus after a short wait and were driven around the rest of the site with several short videos to watch along the way. 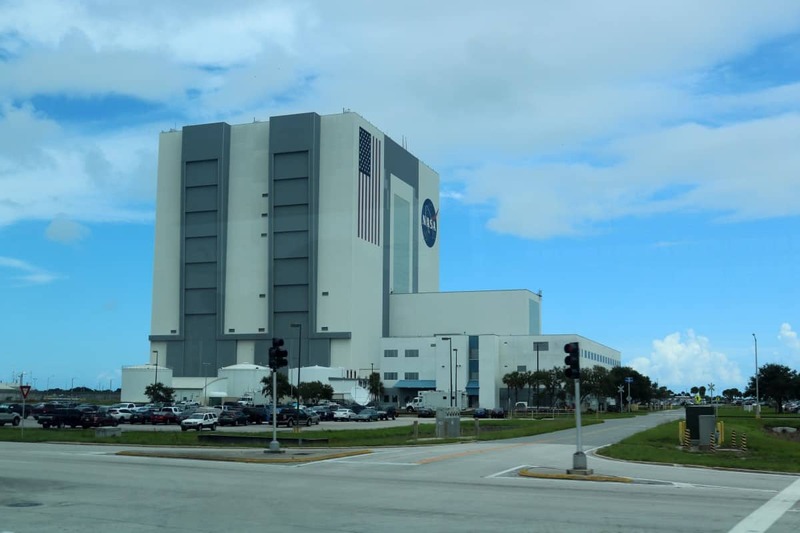 The bus took us past NASA’s Vehicle Assembly Building which is where all of the rockets and shuttles are put together before being mounted on the ‘Crawler’ to be taken to their assigned launch pad. We were also fortunate enough to see crew working on the Crawler as it was due to be driven later on in the day. Although we didn’t get off the bus, we saw enough of the area to appreciate the history and significance of it. 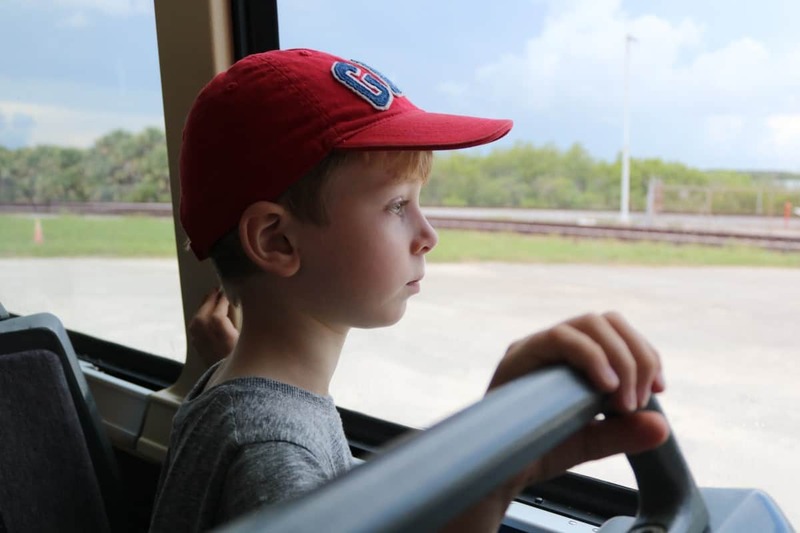 The bus tour then took us to the Famous Launch Pad 39A where the Apollo missions and many shuttle missions took off from. It is currently being used by Space X, a private Space exploration company who have a large hanger nearby. The bus then took us to the Apollo exhibit, which if you hadn’t already guessed, is dedicated to the Apollo moon missions. After a short video introduction we walked through to a recreation of Mission Control where an Apollo launch is simulated and the consoles used in the recreation are the actual ones that were used in the 1960s. 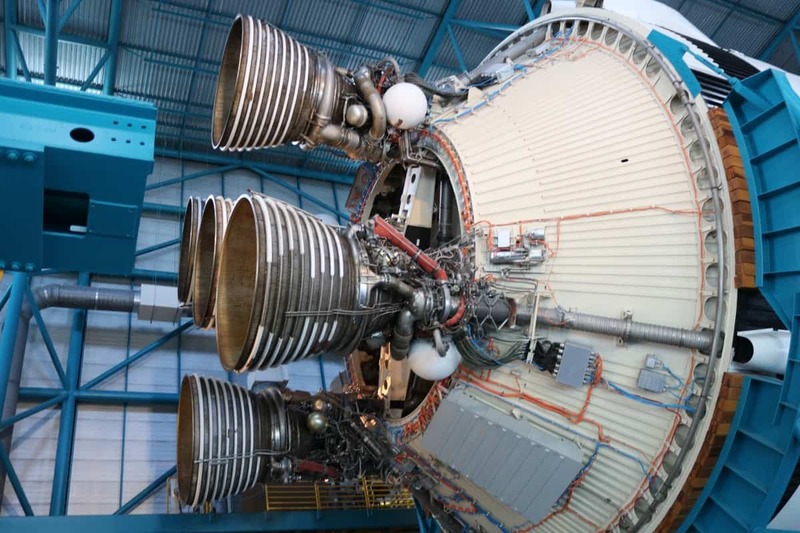 Each screen and readout works with scientific data, camera views of the rocket up close and even genuine TV coverage that was broadcast at the time. Now, this wasn’t just a show to watch, as the rocket took off, the room actually shook and the windows rattled as if an actual rocket had launched. The silhouette of the launch was also visible out of the window as it rose into the sky. It was amazing to be a part of it and really felt like you were right there, watching a real launch. 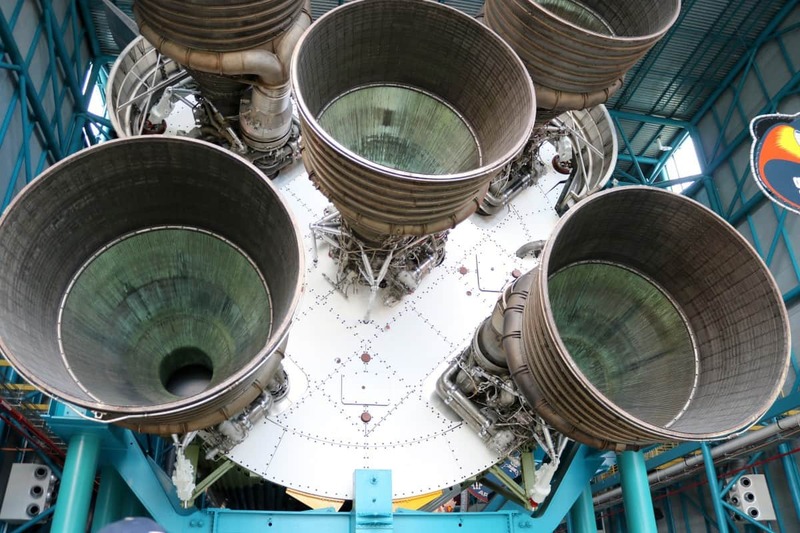 After this, we walked through to a ginormous hanger where, suspended from the ceiling, was a full size Saturn V rocket, separated into its different sections. 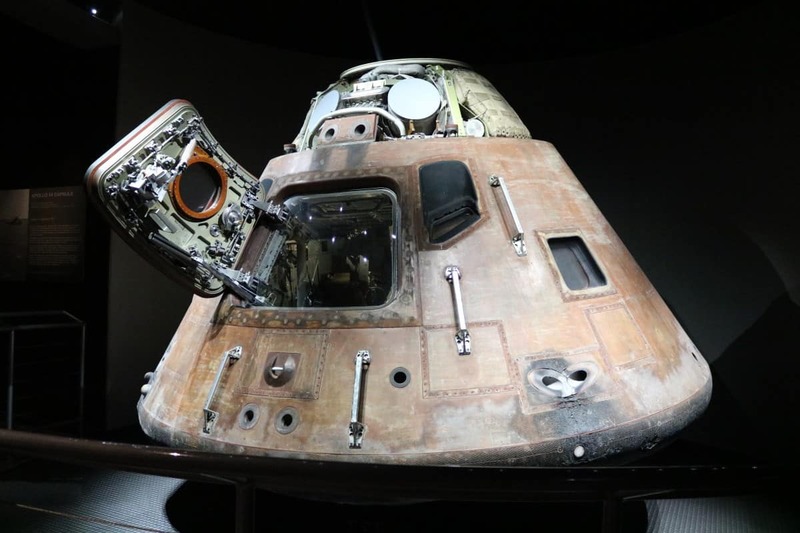 This naturally ran the length of the building with other artefacts and exhibits from each of the Apollo missions on display. A huge mission patch from each of the lunar missions was also hung from the rafters with facts, figures and items from each mission on display underneath. 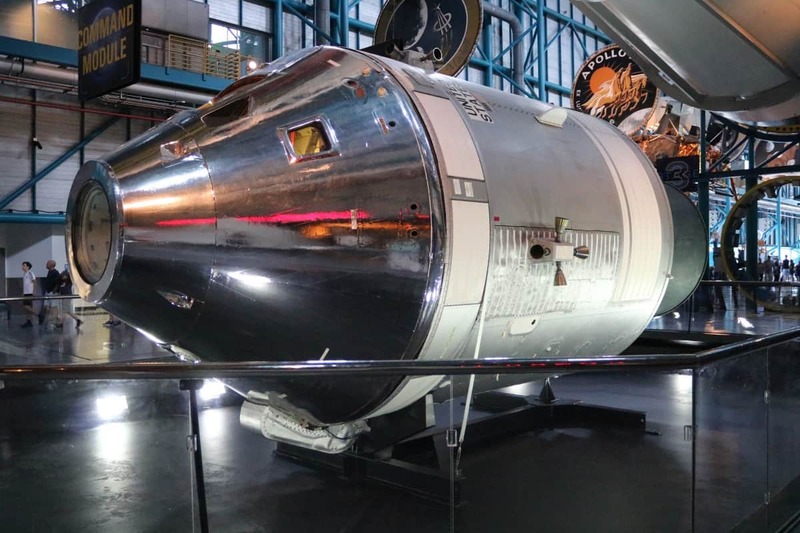 At the far end of the hanger was a dedicated memorial to Apollo One, where the crew perished in a launch pad fire, with histories of the three men, personal artefacts and pieces of the capsule on view. It was all done with dignity and respect and made for an emotional exhibit. In side areas off the main hanger were space suits and collections of artefacts that went to the moon and back. Pieces of Moon rock were on display in this section and it’s mind boggling to read how old they are – billions of years old. They were all beautifully presented with explanations of each item’s significance. 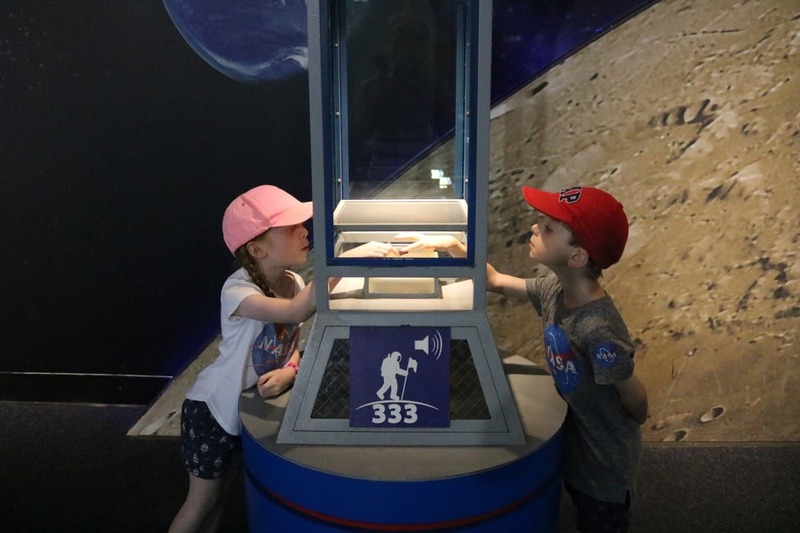 You could still see grey moon dust on the space suits worn whilst walking on the moon and there was also a sliver of moon rock that you could touch on display and the kids really loved the fact that they had touched the moon! There was also a chance to have a mini video made of you ‘walking’ on the moon and having a photo taken. This involved a green screen, some bungee cords and dressing up, but at $30 for one, and then $20 for each extra person in the same clip, this seemed a bit of a gimmick and we didn’t do it. The bus took us back to the main Visitor Center and next on our itinerary was the Atlantis exhibit. Atlantis had the honour of flying the last ever shuttle mission before the fleet was retired in 2011. 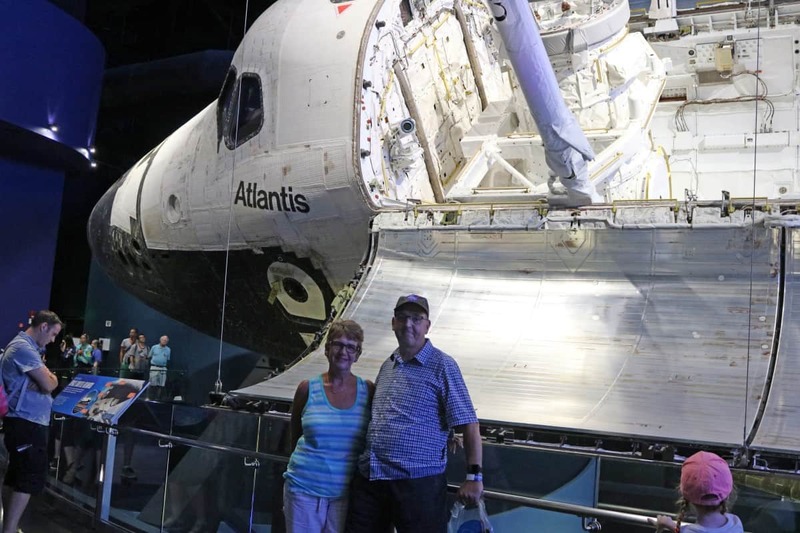 Dave was really looking forward to seeing Atlantis as, when he and his family visited in 1989, he saw Atlantis actually on the launch pad, ready for a mission. Atlantis took off a day or two after they left but Dave fondly remembers seeing it all ready for lift off. When you get to the building there is a short wait for the next entry to start. You walk up gentle slopes to a waiting area with a timer above a set of large doors. When our time was up, we were let in to a holding room where we were told that we would witness a shuttle launch. What happened next was simply stunning. Images of the shuttle’s history were projected all around the room, onto every surface except the floor. The camera then settled to the familiar view of a shuttle on the pad, waiting to launch. It was as if we were watching from only a few hundred feet away. Suddenly, the room lit up and rumbled with the power of the shuttle launch. The images on the walls were synced with what we were hearing and we took off with the shuttle. It was like being in a movie – it was awesome. The finale of the show was mind blowing. Just when we thought the dust had settled and were wondering where we had to go to see Atlantis, the front wall became transparent, revealing the shuttle in all it’s glory. The wall then lifted up and we were awestruck as we walked through into the main viewing area, literally just feet from a piece of history. 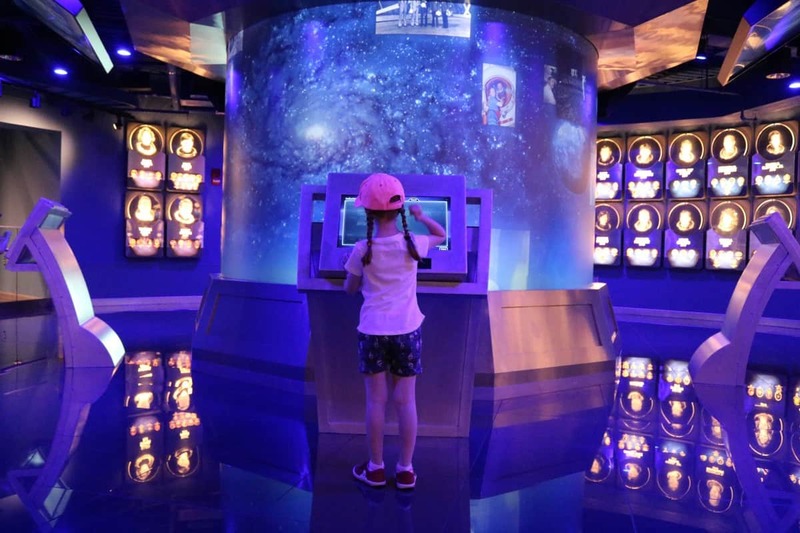 Inside we found thousands of facts, figures and interactive stations all revolving around the shuttle program. There was a mock up of the Hubble Space Telescope and it’s replacement that is due in a few years time too along with a stand alone booster from the rear of a shuttle that you can see up close. The whole area was simply amazing and you could easily spend hours and hours just concentrating on the shuttle. 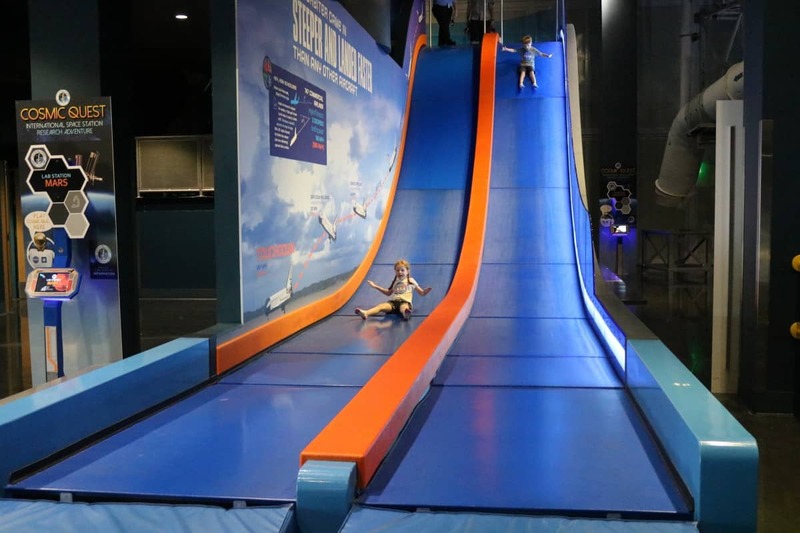 There was a slide for all ages that simulated the gliding landing that the shuttles made and even a mock up of a section of the International Space Station for children to explore. 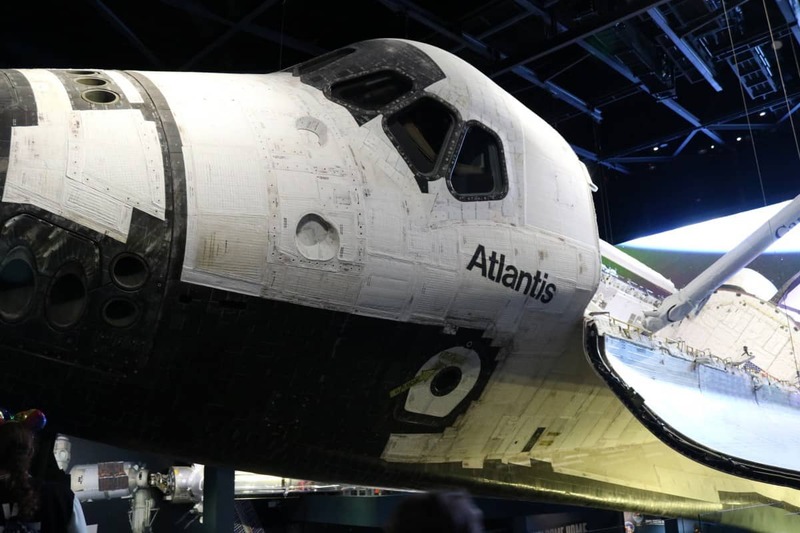 There is also a more realistic shuttle launch simulator to experience before you leave the Atlantis building which we were all eager to try out. After s short video introduction, you enter what is described as the payload section of a shuttle, ready for take off. What happens next is more akin to a theme park ride, but in a good way! After a tense count down, the whole room shakes and loud engines roar. You even feel like you’re being pushed back in your seat and going vertical whilst watching the screen and link to Mission Control. It was very immersive and if you didn’t know any better, you’d swear that you’d just blasted off into space! It was a great way to end the Atlantis exhibit and was thoroughly enjoyed by everyone. 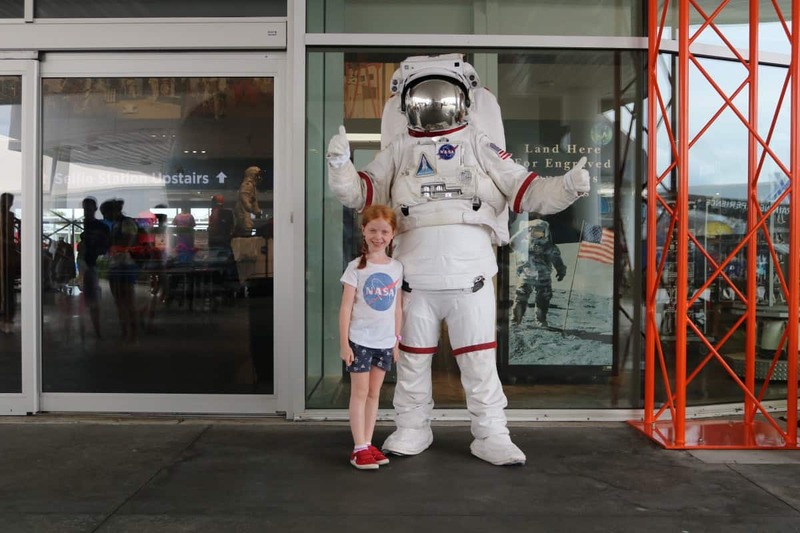 By now, the children were overloaded with science and there was one thing left on our itinerary, to see what the future holds in the Mission To Mars exhibit. We were treated to an excellent presentation where we were shown upcoming missions and future technology intended for use on Mars. There was also a great video presentation where the mission controllers, astronauts and people involved in the planning and execution of a space mission all started out as adults, but as each scene change occurred, the characters all became younger, all ending up as children, as children are the future of space exploration. The worlds largest Space Shop was our last port of call and it was huge, spanning two floors with everything you could want from NASA merchandise. Dave bought a logo hoodie (which he has literally lived in when he’s not been at work!) and we picked up our standard souvenir magnet for our boards at home. It was all reasonably priced as one would expect at such a tourist attraction with a large selection for young and old. 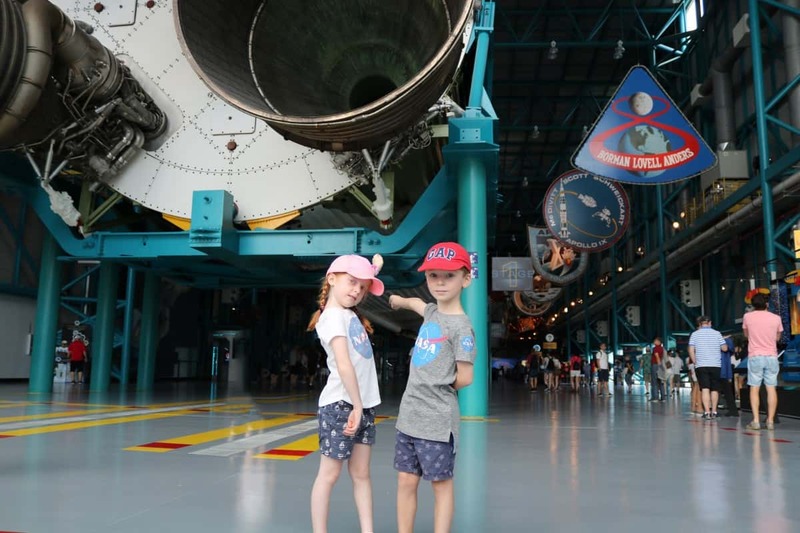 We had such a great day at the Kennedy Space Center and I know it’s somewhere we would visit every time we go to Florida. Parts of it were so full of emotion and the whole day really brought home to us exactly what astronauts have been through – and keep going through – to expand everyone’s knowledge and explore the whole universe for the benefit of mankind. Deep, I know, but wow. We had an incredible day out and it made me so thankful for the space program and the people who are a part of it. They really have made history – and some even lost their lives doing so. I’m honoured to have been able to learn more about them. 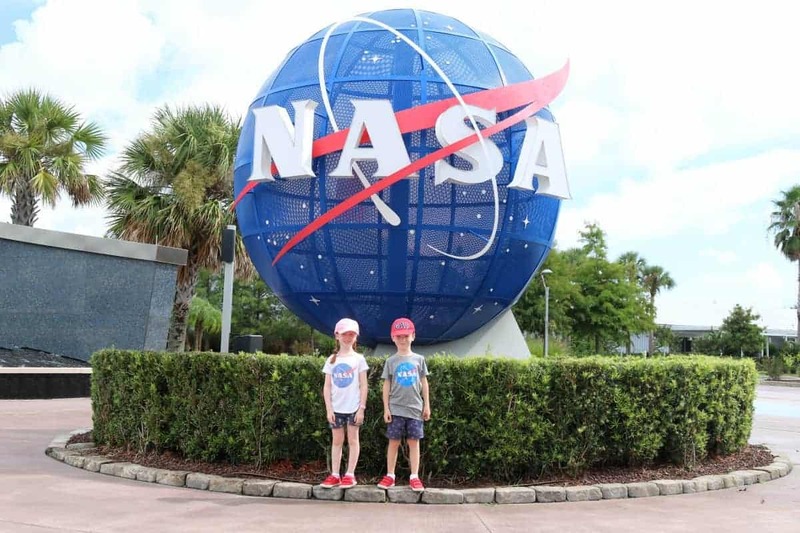 You can also read about other days out we had in Florida – Discovery Cove, Magic Kingdom, ICON 360, an Airboat Ride, Seaworld Orlando,Hollywood Studios, Epcot, Animal Kingdom and Legoland Florida. Previous Post The Massage Company are now in Tunbridge Wells! Ahh I loved reading this. Wow to touching the moon! Of all the places you’ve written about in Florida, this one is the one I’d like to visit the most! 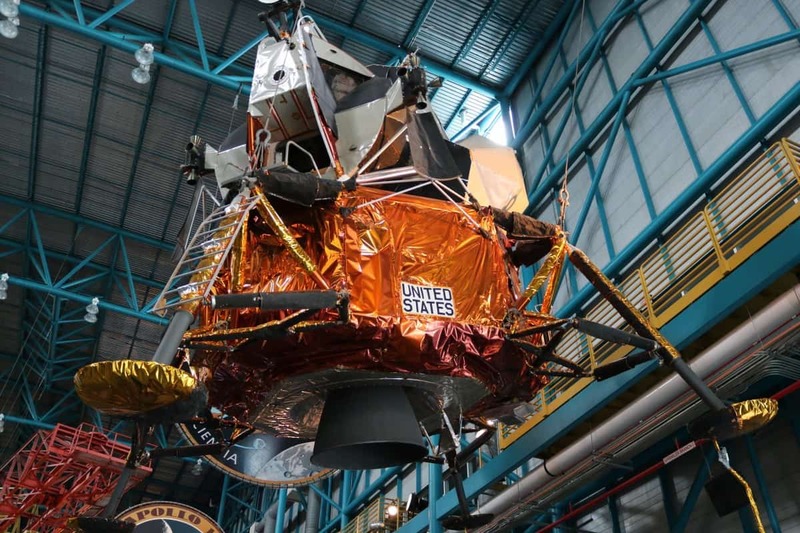 The experience sounds incredible, especially the Apollo exhibit. I bet it has inspired the children to be more interested in science and space!